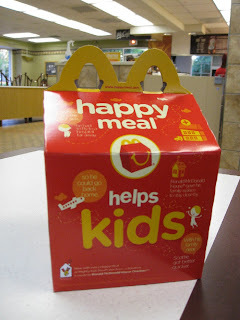 Happy meal helps kids, says the fast-food box. Is that so? Not according to recent medical studies. Kids who live near a fast-food restaurant are more likely to be obese, according to a 2010 study in the International Journal of Pediatric Obesity. Not surprising, given that most kids' meals marketed by national fast-food chains are high in calories, saturated fat, and sodium. Some contain as much saturated fat as the daily maximum recommended for children. In addition, these meals often fail to meet the nutritional standards for children published this year by the Institute for Medicine. In a study published this month (August 2010), The Physicians' Committee for Responsible Medicine analyzed the nutritional content of a children's meal from five national fast-food chains: McDonald's, Wendy's, KFC, A&W, and Burger King. PCRM ranked the meals from worst to least bad. Worst was McDonald's Mighty Kids Meal (double cheeseburger, fries, chocolate milk) with 840 calories and 37 grams of fat. This meal had more than double the recommended limit on saturated fat and sodium for one meal. Second worst was Wendy's Kids Meal of chicken sandwich, fries, and chocolate Frosty, containing 770 calories, 34 grams of fat. KFC Kids Meal was 3rd worst, with popcorn chicken, potato wedges, string cheese, and soft drink: 780 calories; 1800 mg of sodium. Fourth worst was A&W Kids Meal, consisting of a cheeseburger, fries and soft drink, with 780 calories and 9 grams of saturated fat. And fifth worst was Burger King's BK Kids, a breakfast muffin sandwich meal with egg and cheese. It had 95 mg of cholesterol and exceeded the recommended sodium limit for a child's breakfast. Kids' meals at fast-food restaurants are marketed directly to children, with brightly-colored boxes and often a small toy inside. 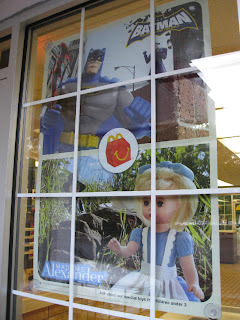 They are also marketed to parents, with statements such as this: [the BK Breakfast Kids Meal] "joins the brand's roster of meals that meet stringent nutrition criteria" - although this BK meal exceeds the recommended cholesterol intake for one meal. What are the consequences of too many calories and too much dietary fat? Obesity, for one thing. According to a study in the Journal of the American Medical Association, 32% of Americans between the ages of 2 and 19 are overweight; 17% are obese. Obesity is associated with a number of health risks, including type 2 diabetes. Another study in JAMA reports that 1/3 of children born in the year 2000 will develop diabetes at some time in their lives. This number is projected to increase as the prevalence of childhood obesity increases. Other health risks of obesity include cardiovascular disease and certain types of cancer (see CDC website). Another concern with fast-food kids' meals is that many contain red and processed meats, including hot dogs, hamburgers, bacon and deli meats. Consumption of these is a key risk factor for colorectal cancer, according to the American Institute for Cancer Research. Red and processed meats have been linked to other cancers too. As a result of a high intake of saturated fat and cholesterol, one in five teens in the U.S. has an abnormal cholesterol level, a contributor to cardiovascular disease - the leading cause of death in the U.S.
Limit your child or teen's trips to fast-food restaurants. Make sure your child is informed about the health risks associated with fast-food. Help kids see the bigger picture, too, and become conscious consumers. 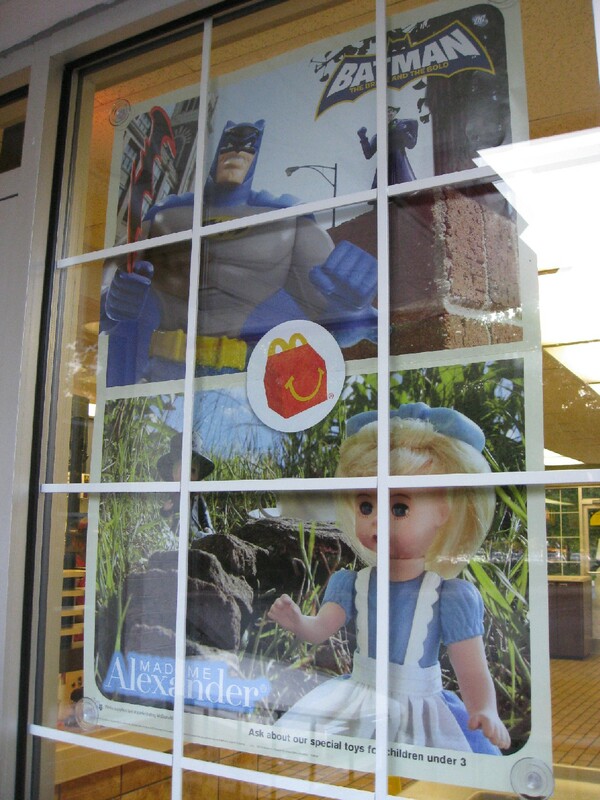 Visiting a McDonald's together is a good opportunity to educate your child or teen about the influence of marketing. The one in my neighborhood has posters of toys inside and outside the building, and huge decals of happy messages for kids stuck to table surfaces. The purpose of corporate marketing is to increase sales and make more money for shareholders, not necessarily to impart accurate information to consumers. One likes to think that federal regulations put limits on false or misleading marketing (such as "this product is a healthy choice") but that's not always the case. You might tell your child or teen the story of "Joe Camel," a cartoon figure that apparently was used to market Camel cigarettes to minors. After years of effectively doing just that, R.J. Reynolds ended the "Joe Camel" campaign in 1997, under pressure from the American Medical Association, Congress, various public-interest groups, and a lawsuit. But only after Joe Camel had increased the teenage-sales of Camel cigarettes from $6 million in 1988 to $476 million in 1992. For more information about corporate goals and ethics, watch the documentary film, "The Corporation." A great family conversation piece. Help your child be an educated consumer. International Journal for Pediatric Obesity. April 2010. "Child body mass index, obesity, and proximity to fast food restaurants". Sally Kneidel, PhD, and Sadie Kneidel. 2005. 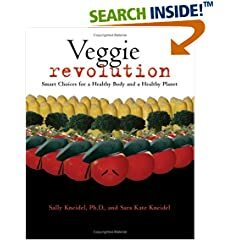 Veggie Revolution: Smart Choices for a Healthy Body and a Healthy Planet. Fulcrum Publishing. Journal of the American Medical Association. "Prevalence of high body mass index in US children and adolescents". Journal of the American Medical Association. "Lifetime risk for diabetes mellitus in the United States". Tiny new frog discovered on Borneo - can it survive deforestation and the illegal wildlife trade? A new pea-sized frog species has been discovered on Borneo! 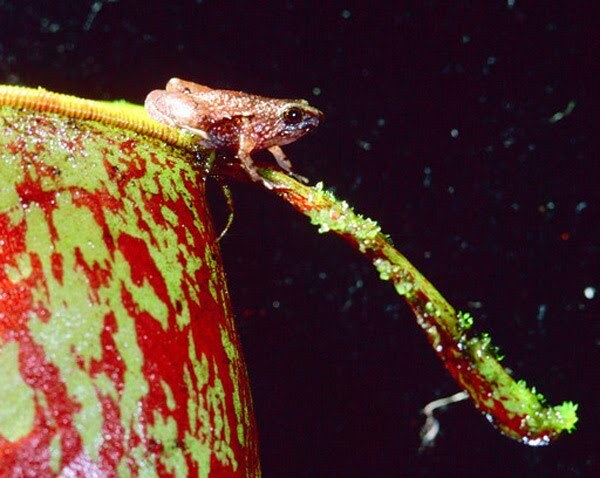 Scientists from the University of Malaysia Sarawak found the tiny frogs living in and around tubular carnivorous plants called pitcher plants. The tadpoles grow in the water inside the plants. 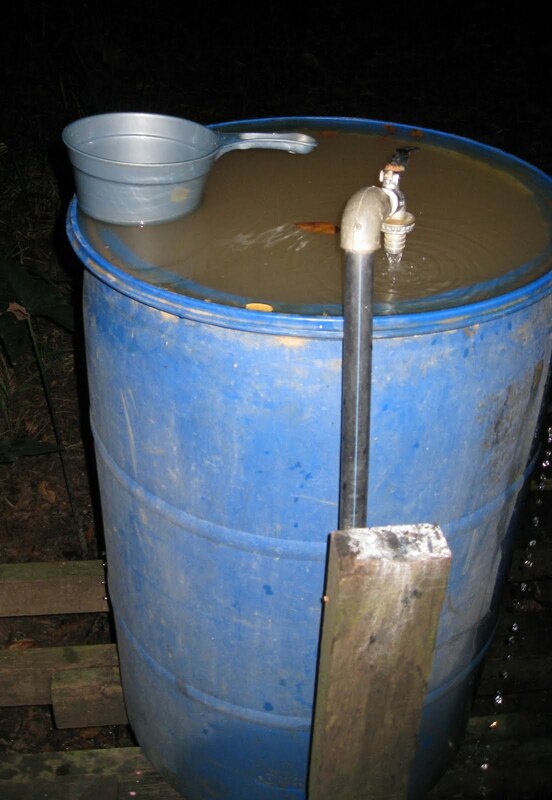 Although the water contains enzymes that kill and digest insects, the frogs and tadpoles are not harmed. The scientists happened upon the frogs in plants near a road, in the mountains if Kubah National Park in the Malaysian state of Sarawak (on the island of Borneo). Because the frogs are so small (a half inch or less), the workers located them not by sight, but by the strange call coming from the carnivorous plants. They described the call as "harsh rasping notes." The species has been named Microhyla nepenthicola, after the pitcher plant where they were found. Borneo is a tropical Southeast Asian island, one of the world's richest biodiversity hotspots, so it's not surprising that a new species would be discovered there. Unfortunately, Borneo is rapidly being deforested and converted to palm-oil plantations; as a result, many of its fauna and flora are threatened or endangered by habitat loss. 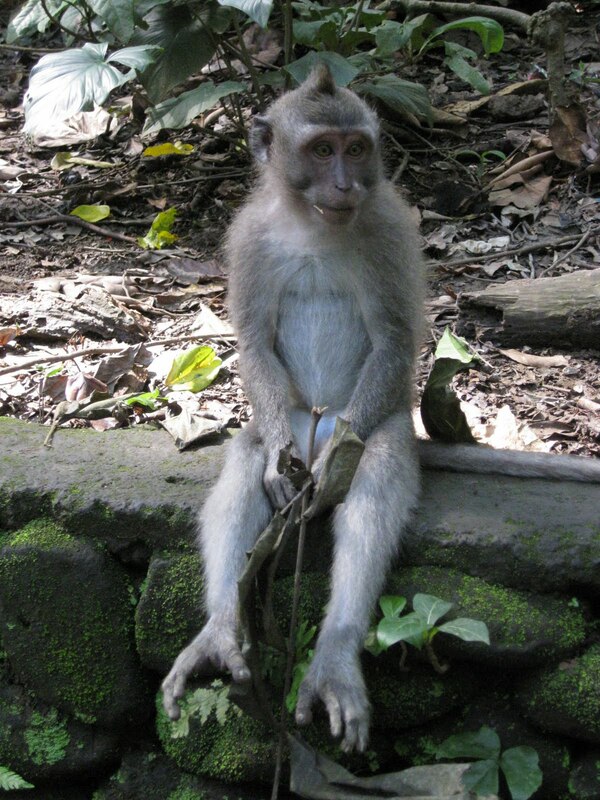 In addition, illegal trade in wildlife is rampant in Southeast Asia . Animals are traded for pets, for traditional medicines, zoos, wildlife collections, biomedical research, and so on. Although laws are in place to protect rare and threatened wildlife, enforcement is lax and trade flourishes with little restriction, even the sale of critically endangered orangutans. Rare species command a higher price in the wildlife markets, and so are targeted by trappers. This fact is not good news for the new frog species. In spite of these threats, a couple of factors may help Microhyla nepenthicola survive. One is their location. 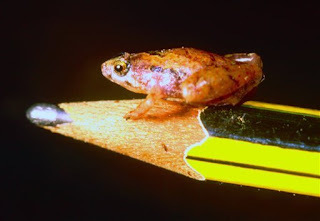 The frogs were found on a mountain, and forests on slopes are more difficult to harvest. Also, they were in a national park, which will offer some protection from deforestation, although illegal harvesting of trees, plants and animals continues in Borneo's national parks because wildlife protection laws are not enforced. 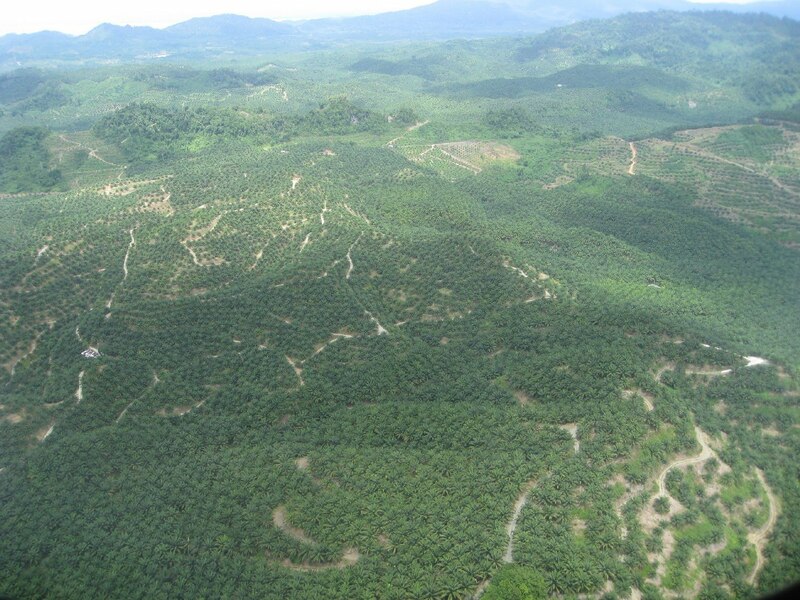 However, the clear-cutting required to establish a palm-oil plantation is unlikely to occur in a national park. 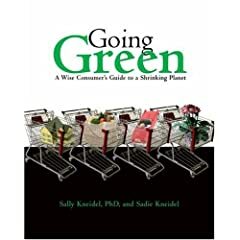 In addition, the frogs may be dependent upon the pitcher plant and unable to survive elsewhere - especially in the wildlife markets, where conditions are dirty, and care provided to animals is minimal. In the four wildlife markets I visited in Indonesia and Singapore, I did not see a single amphibian. They may be there, but I didn't see them. We'll see what happens down the road for M. nepenthicola. I wish them good luck. For more information about wildlife on the islands of Borneo and Sumatra, read my three previous posts about my visits there, and see the links to websites and publications below. Vincent Nijman. 2009. An Assessment of Trade in Gibbons and Orang-utans in Sumatra, Indonesia. A TRAFFIC Southeast Asia report. 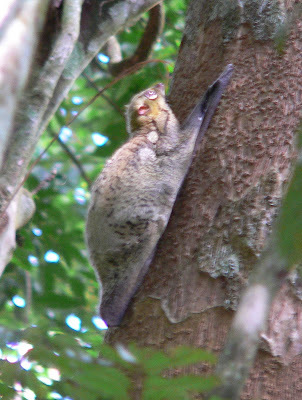 on Kalimantan, Indonesia. A TRAFFIC Southeast Asia report. Vincent Nijman. June 2005b. In Full Swing: An Assessment of Trade in Orangutans and Gibbons on Java and Bali. A TRAFFIC Southeast Asia report. Serge A. Wich et al. 2008. Distribution and conservation status of the orang-utan (Pongo spp.) on Borneo and Sumatra: how many remain? Fauna and Flora International. Oryx 42(3):329-339. Eric Meijaard et al. August 11, 2010. 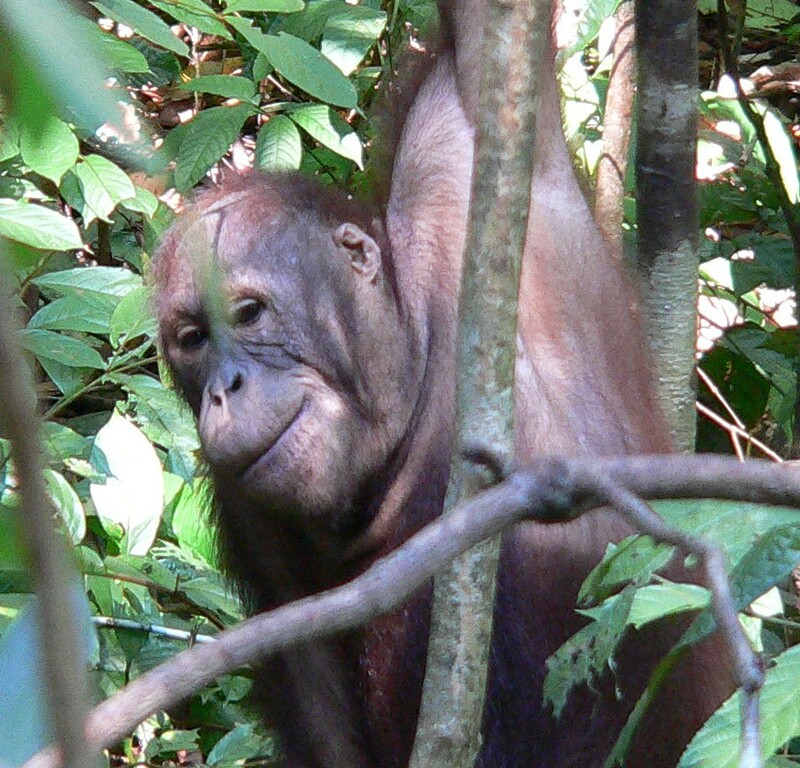 Hunting a key factor in Orangutan's decline. TRAFFIC home page. A baby orangutan living as a pet. Photo by Chris Shepherd (TRAFFIC Southeast Asia); used with permission. Originally printed in TRAFFIC publication "In Full Swing..." listed below. "Having a pet orangutan is a status symbol," I was told by my Indonesian friend Ria, who lives and works in Jakarta, Indonesia's capital. Doesn't matter if the animal lives in a small, dirty cage behind the house, which most do; it's still a social asset to have one. That's too bad, because the local, national, and international demand for young orangutans as pets is a major threat to the survival of both species: the Bornean orangutan and Sumatran orangutan. Since both are endangered, they are theoretically protected by law from commercial trade. However, in Indonesia, these laws are mostly ignored. Habitat loss remains the single biggest threat to orangutans, but as it turns out, the pet trade and deforestation are closely linked. 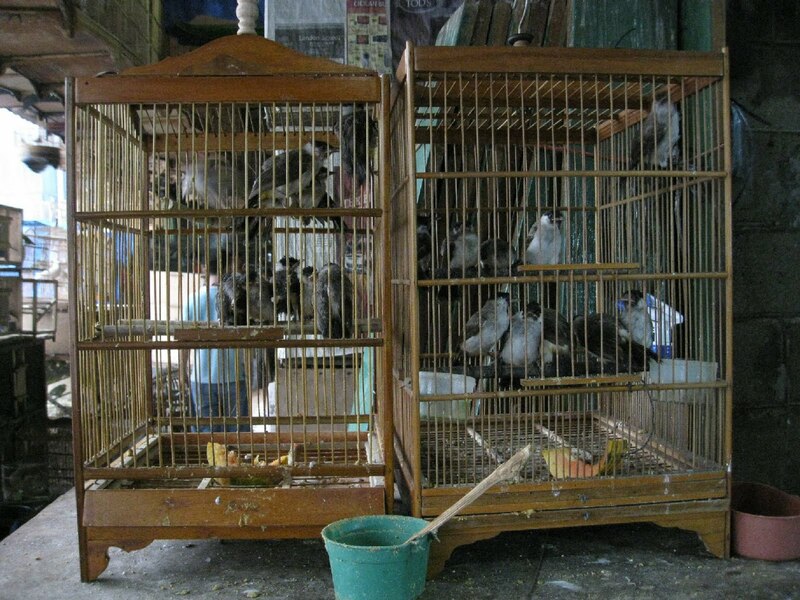 Almost every Indonesian city has a bird or wildlife market, where legal and illegal species are sold by independent vendors to anyone who can pay. I went to 4 of these markets during my Asian travels, including Indonesia's biggest market - Pramuka, in downtown Jakarta. 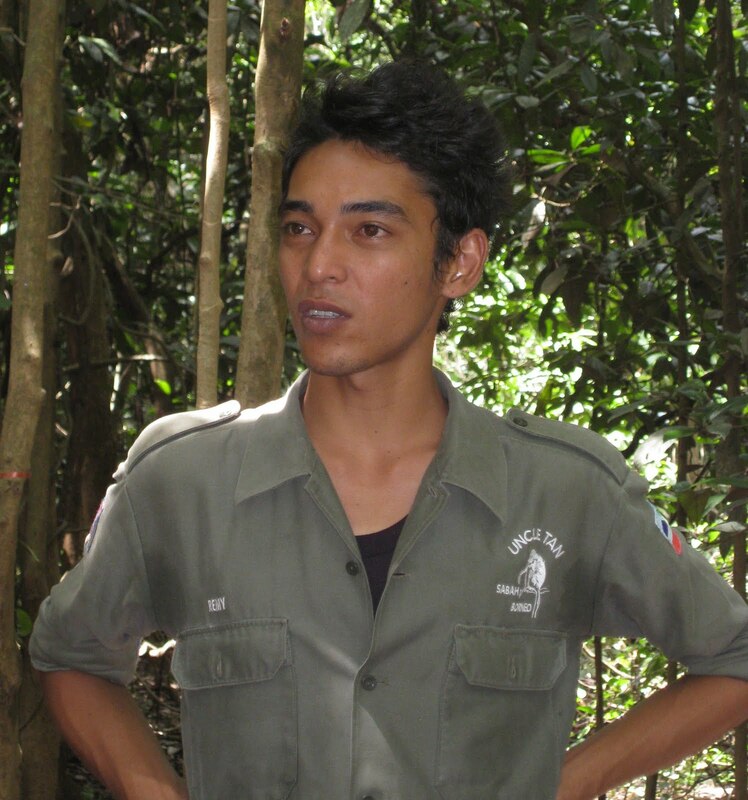 I hired an Indonesian from "ProFauna Indonesia" (a wildlife conservation NGO in Jakarta) to go with me as my guide and translator. 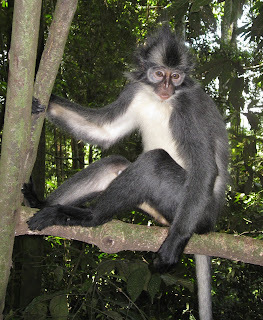 We saw plenty of wild-caught primates, birds, reptiles, and small mammals at Pramuka. But we didn't see any orangutans. We were, however, offered a baby orangutan for the price of 20-25 million IDR ($2200-2800) and an adult orangutan for 30 million IDR ($3300). Pramuka is famous for its network of homes behind the market (referred to as "in the back") where especially valuable or illegal animals are kept safely out of sight until a sale is made. The baby leopard that was offered to us at Pramuka. The majority of vendors would not talk to us about orangutans they might or might not have, because I was not in one of the demographic groups that typically buy animals (Chinese and Koreans are likely to buy, they said. Australians, Europeans, and Americans just look.) But this one vendor did talk to us about orangs - the one who quoted us prices. He said that he didn't have an orangutan on the spot, but "could bring it directly," if we had the money. Since we didn't slap down the money, we didn't get to see it. Although orangutan sales in the past may have been concentrated at wildlife markets, nowadays sales often occur at other locations. Pet orangutans may be moved from the interior of the country to more developed coastal towns, or professional traders may travel to a remote area and buy or order young orangutans to transport to populated areas. According to TRAFFIC's Vincent Nijman, most forest-dwelling people in Indonesia know the commercial value of an infant orangutan. Given the absence of effective law enforcement, few will resist the opportunity to obtain an infant to sell In a country where more than half the population survives on $2/day or less, young orangutans are regarded as valuable trade commodities. The situation is frustrating, and even incomprehensible in some ways. What is the Indonesian government doing to stop this "harvesting" of orangutans like they were ears of corn? Here's a fact that surprises most Americans: the illegal trade in animals and animal parts is the 3rd biggest blackmarket in the world, behind drugs and arms. Indonesia is an epicenter of this illegal trade, because of the country's rich tropical biodiversity and because of the laissez-faire attitude of the Indonesian government. Although the country has enacted a range of laws and regulations to protect species and limit deforestation, the government fails to enforce these laws effectively. Indonesia is also a Party to the Convention on International Trade in Endangered Species (CITES), and both orangutan species are listed in Appendix I, which prohibits all international commercial trade of these species among contracting Parties. Yet this treaty, like the local legislation, is generally ignored. 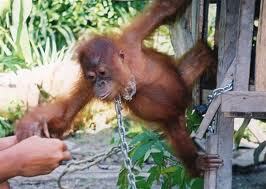 I was told by several Indonesian conservation workers that if an Indonesian is found to possess a pet orangutan, the chances of having the animal confiscated or of facing prosecution are extremely low. Rather, the pet owner can, upon discovery of his pet, probably obtain a permit from the government that will allow him to legally keep the orangutan. TRAFFIC researcher Vincent Nijman found that, in spite of existing laws and treaties, the number of confiscated orangutans being delivered to rescue centers and the number of new arrivals at local zoos has remained more or less steady over the last 15 years, suggesting that the brisk trade in orangutans is not decreasing. "TRAFFIC: the wildlife trade monitoring network" is very active in Southeast Asia and has studied the situation closely and made several recommendations that seem to hit the nail on the head. Their published papers are excellent sources of information. (See "Sources" below.) When I got home from my journey, I sent TRAFFIC copies of all my wildlife-market photos and videos, in case they might be helpful. They're working hard; I want to help! 1. Better protection of the remaining forest is needed - through the Indonesian government, land concession holders (timber and palm-oil companies), and landowners. 3. Handing out registration letters to make pets "legal" needs to be stopped immediately. Persons whose protected wildlife is confiscated should face legal charges as a deterrent to others. In my next posts about s.e. Asia, I'll explore the causes of deforestation on Borneo and Sumatra, and why it continues unabated in spite of the considerable efforts of NGOs to stop or slow it. I'll also post the pictures we took of wild-caught and protected birds in the bird markets of Jakarta and Singapore. 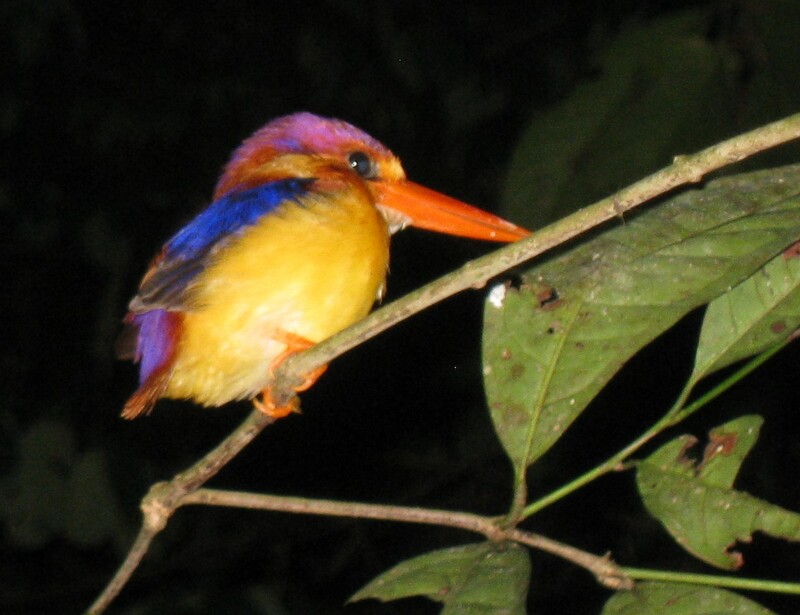 Why are wild birds so popular as pets in tropical Asia? I'll tell you what we learned. 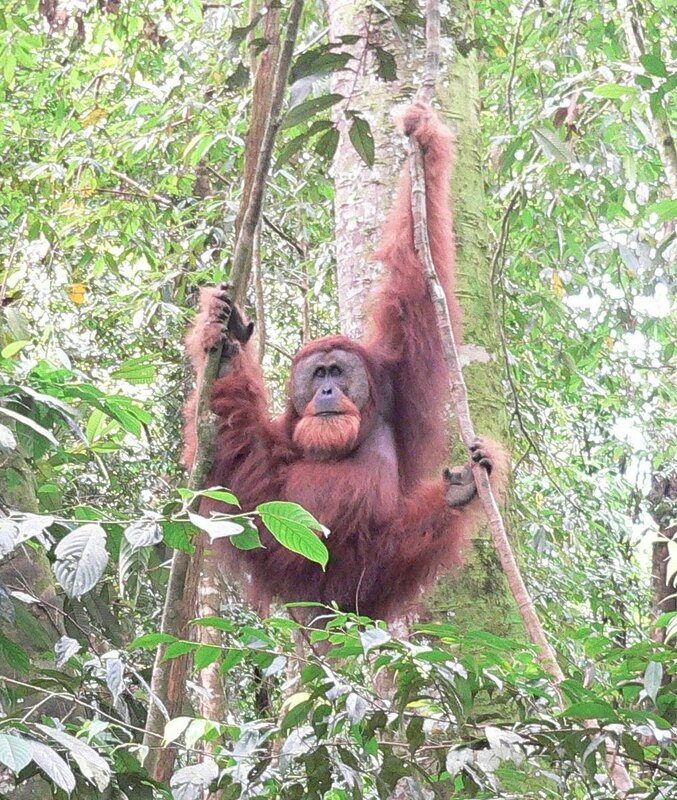 On my Asian quest to see wild and semi-wild orangutans (with my husband Ken), I wasn't sure I'd find a single one of the red apes roaming free in a forest. Orangutans used to be widespread in Southeast Asia, but now survive only on the islands of Borneo and Sumatra. Orangutans on both islands are in serious trouble. Only 6500 Sumatran orangutans (Pongo abelii) survive in the wild. The World Conservation Union lists the Sumatran species as "critically endangered" on their IUCN Red List. Sumatran orangutans are considered one of the world's 25 most endangered primates. The Bornean orangutan (Pongo pygmaeus), with around 45,000 individuals left in the wild, is also on the IUCN Red List, as "endangered." The IUCN predicts that both orangutan species will be extinct in 10 to 30 years if no progress is made in overcoming the threats to their survival. The biggest threat is habitat loss, due to the conversion of forests to palm oil plantations. Road networks often fragment the forests that are left standing. These two factors are responsible for the loss of more than 80% of orangutan habitat in the last 20 years, and the rate of loss is not slowing. Poaching is another major threat to orangutan survival - mostly for the pet trade. 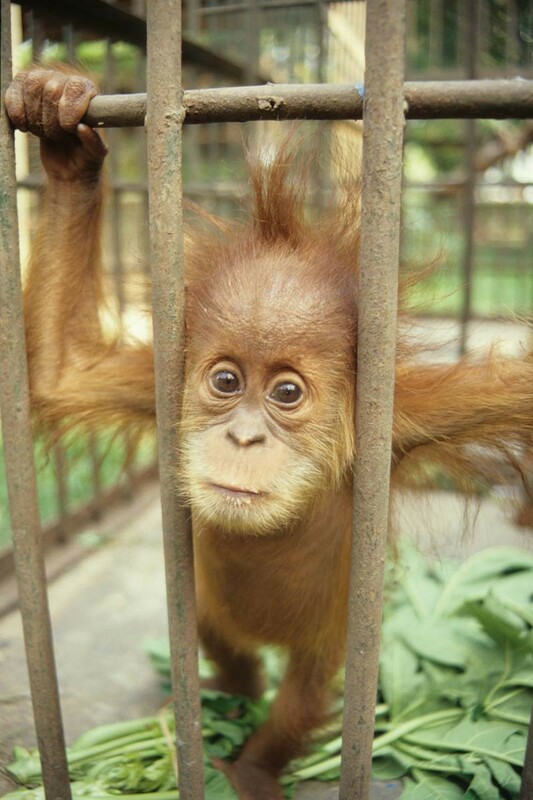 According to SOS, there's a huge local, national, and international demand for infant orangutans to be kept as pets. To capture an infant, poachers usually kill the mother. Since I was determined to spot some orangutans, hopefully wild ones, I chose my Asian destinations accordingly and arranged everything myself. No group tour, no package trip. I chose Danum Valley Conservation Area in northern Borneo because it's one of the largest and best-protected lowland rainforests remaining in southeast Asia. The 438 sq km reserve is said to be one of the best places in the world to see truly wild orangutans in their natural habitat. 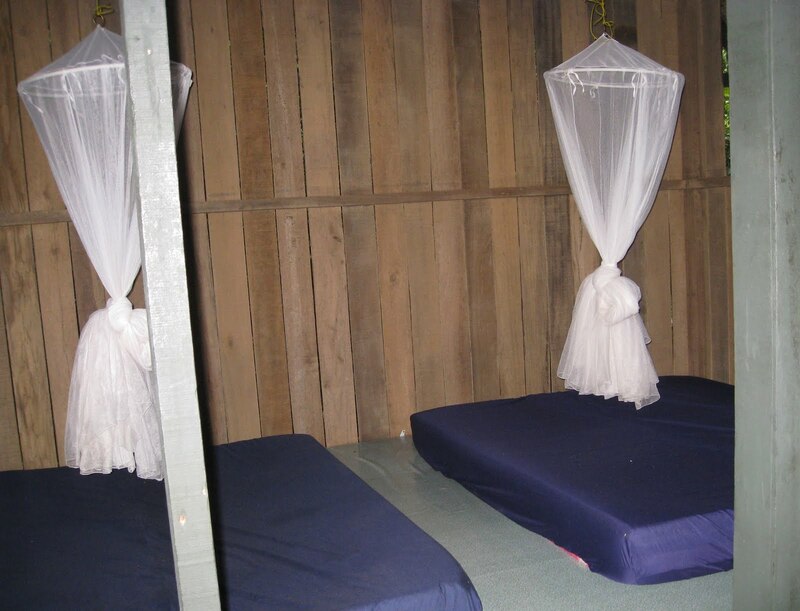 An expensive option for staying in Danum Valley is Borneo Rainforest Lodge. The other choice is the more spartan Danum Valley Field Centre, which is cheaper but gives preference to researchers (which I was not). DVFC is promoted as the leading rainforest research center in the Old World tropics. Tourists can stay at DVFC in limited numbers, but there are no guides. So you're on your own on the forest trails. 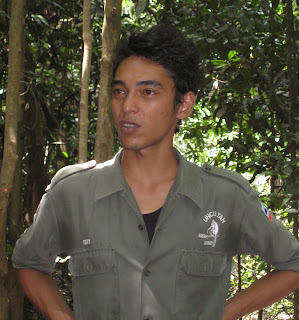 I know from experience that having a wildlife guide can make a world of difference in what I see while forest trekking. The first wild orangutan I saw, at DanumValley Field Centre (Borneo). You can see the small green fruit she was eating, still on the twigs in front of her right arm, and a tiny piece in her mouth. Photo by Sally Kneidel. 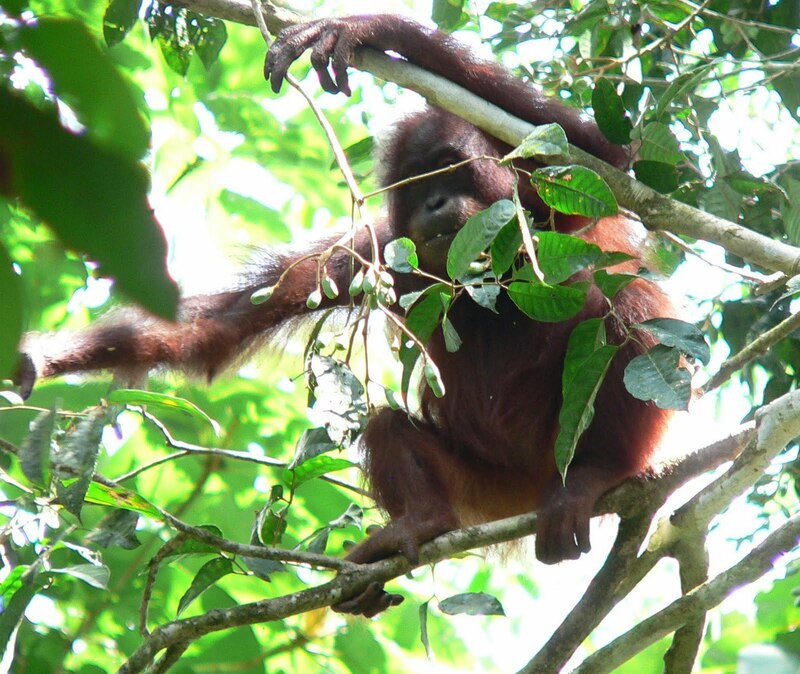 In spite of not having a guide, I saw my first wild orangutan at DVFC. She was busy eating nut-like fruits in a tree overhead, dropping the inedible pieces like rain all around me. I was thrilled, and riveted, my head tilted back so far that my neck ached. But I couldn't look away from her. I was surprised at how red she was, how long her hair was, and that she seemed unconcerned about my presence. I saw her on several different days in the same tree. 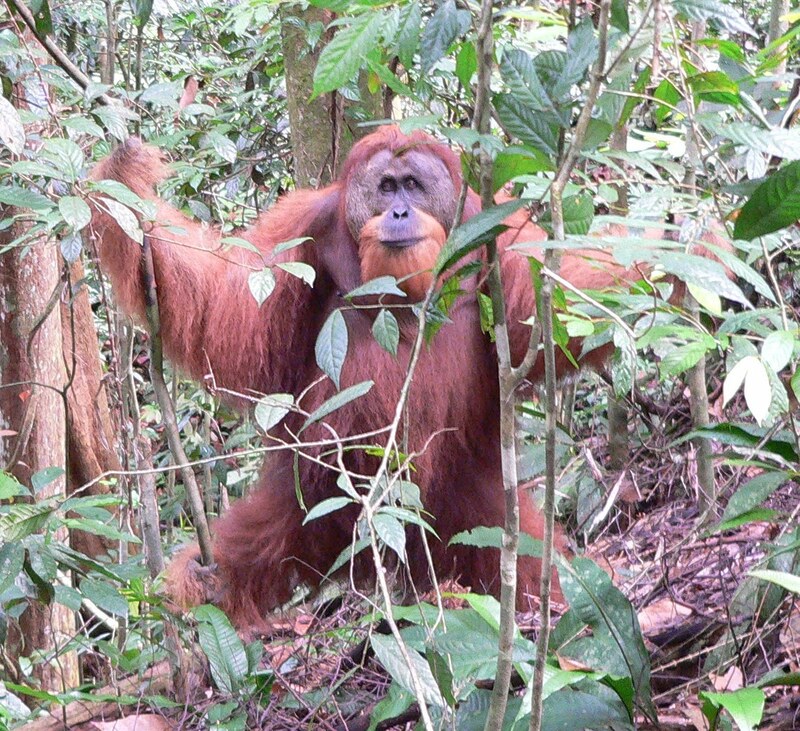 I was lucky to see 4 or 5 other orangutans at DVFC too, but those were just fleeting glimpses through dense foliage. I would have seen more with a guide, no doubt, but that was okay. With hours of trekking on the trails, I also came upon lots of long-tailed macaques, pig-tailed macaques, a "flying lemur," and a troop of gorgeous red leaf monkeys (maroon langurs). And a Borneo pygmy elephant! ...just as its rear end disappeared into the undergrowth. Danum Valley was definitely worth my 5-day stay. I'd go back there in a flash. A "flying lemur" clinging to a tree at DVFC. They are unrelated to the true lemurs of Madagascar. Photo by Sally Kneidel. Although the Danum Valley Conservation Area is rich in wildlife, it is unfortunately bordered on every side by 3-100 km of commercial forests that are rapidly being logged, and beyond those are palm-oil plantations. 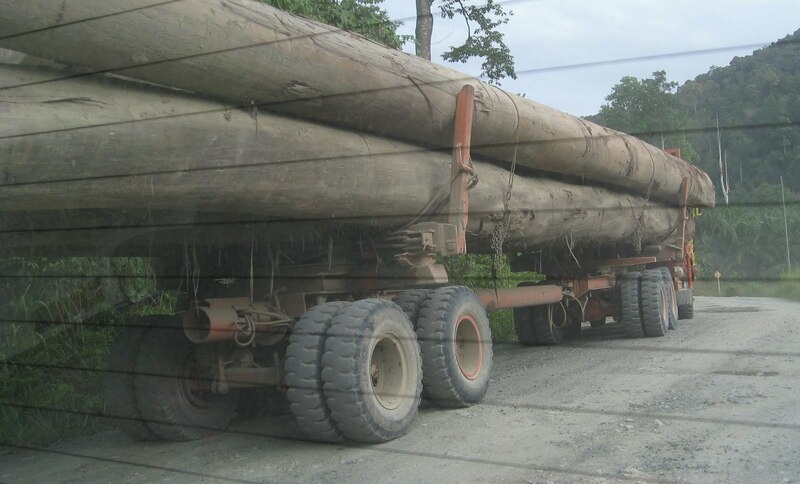 The road to DVFC is a forestry road; we passed 10 to 12 trucks loaded with huge tree trunks on the way to the Field Centre. That was depressing. One of the dozen logging trucks we passed on our way into Danum Valley Conservation Area. Photo by Sally Kneidel. Before I left home, I booked a room near Sepilok Orangutan "Rehabilitation" Center because it was the one place I felt assured of seeing an orangutan, if all else failed. Sepilok is the second most visited tourist attraction in Malaysian Borneo, just after Mount Kinabalu. 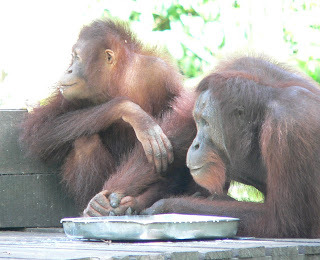 Its appeal is an orangutan feeding platform in a forest setting, where a worker sets out fruit and a pan of milk twice a day for the few orangs that live there. Tourists can watch from a viewing platform about 50-75 feet away, as 1 to 4 orangutans show up for the snacks. The center claims to be rehabilitating orangutan orphans and releasing them into the "surrounding wild population," although the center has only 40-43 sq km of forest so there can't be much of a population. The center also claims to guard against physical contact between orangs and humans, who can infect the orangs with human viruses like hepatitis, herpes, and influenza. But I watched 4 different feeding sessions, and the workers ignored the ban on physical contact. They handed fruits to the orangs and patted them like pets, both of which were totally unnecessary. I also saw a tourist at the center with an orangutan in her lap, cheek to cheek, while her friend snapped photos. No one who worked there paid any attention. 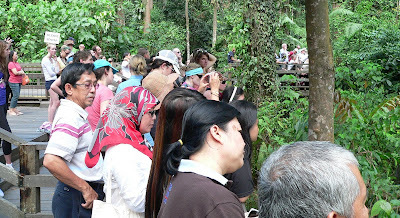 The one Sepilok orangutan that I saw fairly close, on the boardwalk to the viewing platform, had a serious eye problem that appeared to be a bad infection - the eye was swollen shut. Contracted from a cheek-to-cheek encounter with a tourist? Could have been. Had I known in advance that I would see orangutans elsewhere, I would have skipped Sepilok. Although I have to admit the spectacle of 100+ chattering tourists packed onto the sweltering viewing platform was interesting in itself. One person collapsed with heat stroke while I was there, losing control of her bowels. 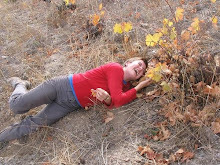 She lay prostrate for a half-hour, then was slowly escorted out, still woozy. I noticed the next day that no one had cleaned off the boardwalk, and the excrement was still there. Not exactly careful health protocol, for barefoot visitors or the macaques and orangs that use the boardwalk when the crowds are gone. 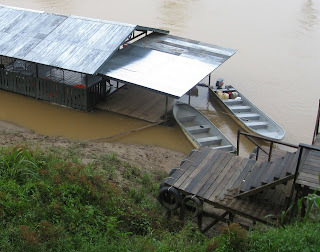 After reading on Lonely Planet's "Thorn Tree travel forum" about orangutans along Borneo's Kinabatangan River, I booked a 3-day stay at Uncle Tan's Jungle Camp on the river. Getting there requires an hour-long van ride followed by a 2-hour boat ride. The boats are small, open motor boats with backless metal benches - not the most comfortable. Especially if you're prone to lower-back pain like I am. The schedule includes hours of boat rides every day, looking for wildlife. I did see one orangutan, and 3 other primates that were all new to me: proboscis monkeys, Bornean gibbons (gray gibbons), and a silvered leaf monkey. Nice, but all were too far away to photograph. From the boat, we also saw crocodiles, long-tailed macaques, Oriental pied hornbills, a black hornbill, a "leopard cat," a common palm civet, a flying fox (a huge bat), a buffy fish-owl, etc. The night walk with our excellent guide Remy was great; he pointed out colorful birds sleeping on low branches right beside the trail, such as a rufous-backed kingfisher, scarlet-rumped trogon, and a little pied flycatcher. 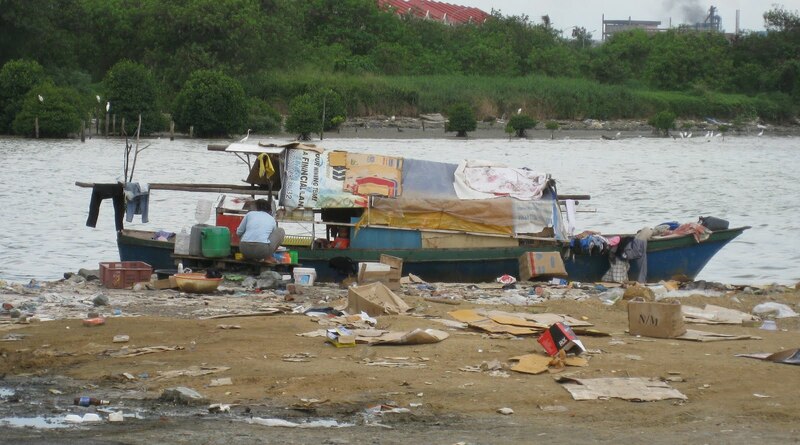 I've heard the accommodations at Uncle Tan's described as "substandard." I guess I agree with that. The doorless open-air huts were on stilts in a swamp, furnished only with mattresses on the floor and mosquito netting. No pillows...but the sheets were clean. The only water available for ablutions was river water that the guests had to ladle out of a barrel, next to the pit toilets. When I read about this in advance, it sounded rustic and adventurous. In reality, it wasn't that pleasant. The frequent and long boat rides, while they did give me new primate sightings, grew wearisome. I hate to be a wimp, but I wouldn't go back there and probably wouldn't recommend Uncle Tan's except for the hardiest of travelers. Not for naturalists interested in photography. The brightest star of my stay was Remy the guide, who gave me a lot of information about deforestation in the area when I asked. He said 70% of the Kinabatangan River is bordered by palm-oil plantations that come right up to the river, and he showed me a map to prove it. That was distressing news, but didn't surprise me. I hit the wildlife jackpot on the island of Sumatra, with a fantastic orangutan experience in Gunung Leuser National Park. GLNP is one of the most famous parks in Asia for travelers and scientists. The park has been recognized internationally as a Biosphere Reserve, a World Heritage Site, and an ASEAN Heritage Park. It's a huge park, with 10,946 sq km of mountainous and lowland forests, swamps, and mangroves, and is home to four big Asian mammals: Sumatran orangutans, Sumatran tigers, Sumatran elephants, and Sumatran rhinos, plus a number of other primates. 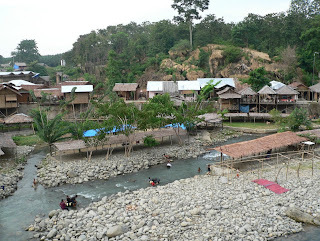 The jungle village of Bukit Lawang is right across the Bohorok River from the entry to the park so I bunked in the village, while trekking during the day on the park's steep jungle trails. Helen with the Sumatran Orangutan Society suggested my husband and I call Expedition Jungle to find lodging in Bukit Lawang. We did. Expedition Jungle booked us at Sam's Bungalows, provided transport to and from the airport in Medan, and provided a guide for our jungle forays. On the first day trekking, my husband and I and our local guide had been going straight uphill for some time on a jungle trail in Gunung Leuser National Park, when all of sudden we came upon a mother and baby Thomas's leaf monkey in a tree right next to the trail. The youngster fled, but the mother sat and watched us for several exciting minutes. An hour later, we were still farther up the mountain when I heard my husband, up ahead of me, calling my name quietly but urgently. I ran up the trail over a little hill and right in front of me, 30 feet from the trail, was a gigantic adult male orangutan gazing my way, perched between two saplings. I had not seen an adult male before in the wild and I was stunned by his size, his huge volume of shaggy red hair, the breadth of his face, the size of his huge hands and feet - the whole scene was mind-boggling. I let out an expletive of shocked delight and began groping for my camera, unable to take my eyes off of him. Was he the best thing I've ever seen? Maybe. Except for the first time I laid eyes on my own children. If I had to recommend one place to look for orangutans, it might be Gunung Leuser National Park (we also saw several white-handed gibbons there). Bukit Lawang is a fascinating town to use as a base (more about that in a later post), but it's not the only village with access to the park. Berastagi is another one. I know some guide books recommend Tanjung Puting National Park in southern Borneo as the best place for orangutan-viewing. And it might be - I don't know. I didn't go there because it was too hard to make arrangements by email (I tried), and the prospect of living on a tiny boat (a klotok) for several days didn't really appeal to me. Linda Spalding wrote a great memoir (A Dark Place in the Jungle) about her klotok trip up the Sekonyer River in Tanjung Puting. 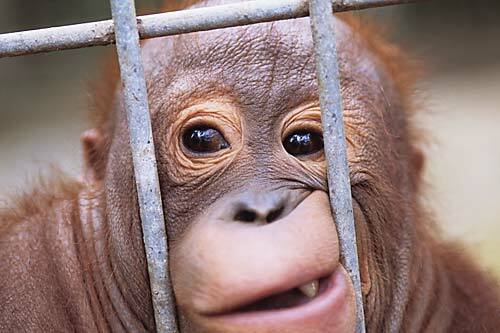 I'll be writing more about all these places, and about the challenges to orangutan survival. After seeing our furry red relatives in their natural habitat, I feel more intrigued than ever to learn what can be done to protect them. Stay tuned. Tamara Thiessen. 2008. Borneo: Sabah, Brunei, Sarawak. Bradt Travel Guides, UK. Myers, Susan. 2009. Birds of Borneo. Princeton Field Guides. Rowthorn, Chris. 2008. Borneo. Lonely Planet. Williams, China et al. 2008. Southeast Asia on a Shoestring. Lonely Planet. Text and all photos by Sally Kneidel, PhD. 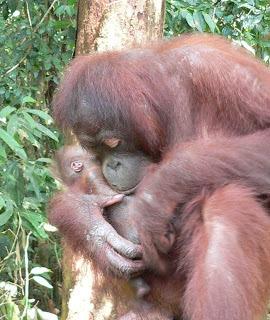 A mother orangutan cradles her baby tenderly, at a forest refuge in Borneo. Photo by Sally Kneidel. 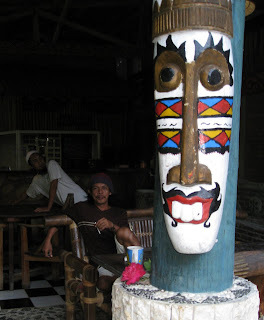 I've wanted to visit Indonesia for years - it has more tropical rain forest than almost any other country. Only Brazil has more. Indonesia is a nation of more than 13,000 islands, including Borneo, Bali, Sumatra, and Java. Although crowded and impoverished, Indonesia is a biodiversity hotspot, home to tigers, sunbears, elephants, rhinos, and best of all, orangutans. The biggest draw for me are the orangutans. Orangutans were common on Borneo and Sumatra at one time, but their populations are shrinking fast due to massive deforestation. Even in areas where they still survive, orangs are elusive and hard to spot. 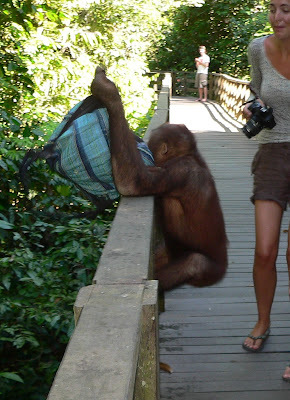 So when I finally made that trip to southeast Asia a couple of months ago, my hopes of seeing orangutans weren't high. I had to give it a try, though, before the red-haired apes are all extinct. I also wanted to understand the challenges to their survival - the forces driving deforestation, and the illegal wildlife trade that's rampant in s.e. Asia. Poverty and overpopulation are major causes of habitat loss and wildlife poaching in Indonesia - around half the population lives on $2 a day or less. When jobs are scarce, a hungry family can make good money selling timber or trapping wildlife illegally for the pet trade, food, traditional medicines, and research labs. According to Interpol, the trade in wildlife and wildlife parts is the 3rd most lucrative blackmarket in the world, just behind drugs and arms. 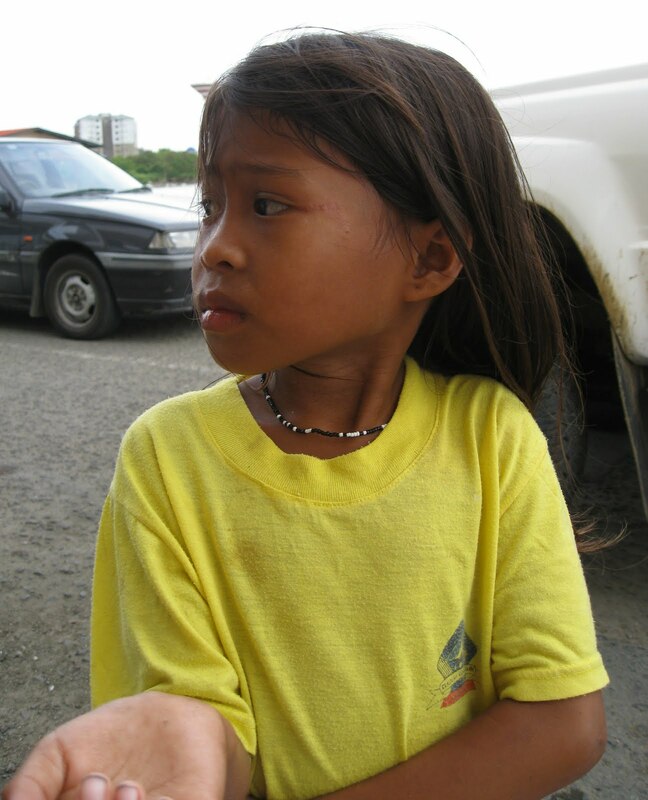 I saw plenty of poverty in Indonesia and in Malaysian Borneo (the northern part of the island of Borneo is Malaysia, the southern part is Indonesia). 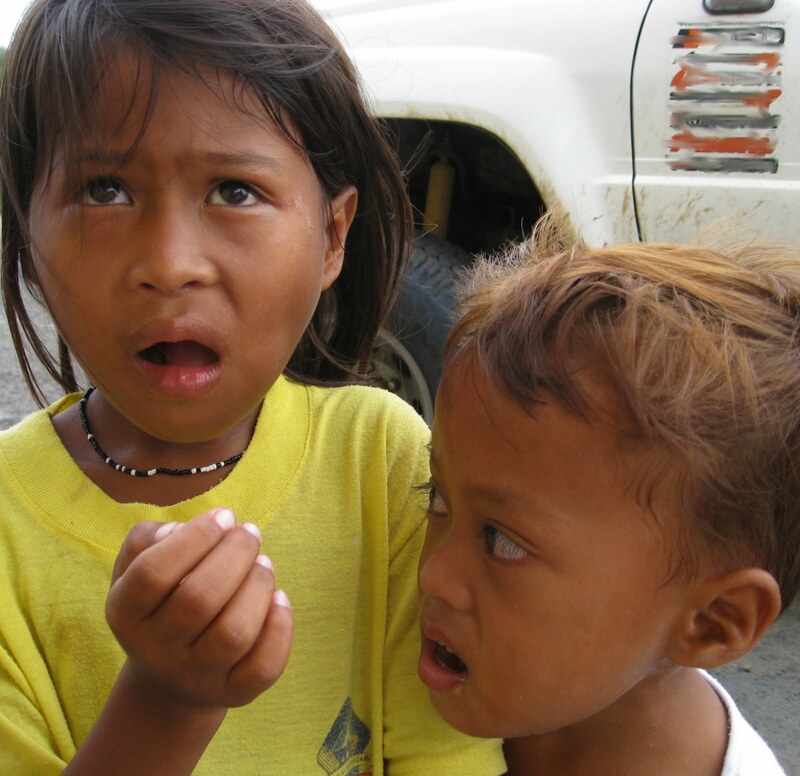 Above, Indonesian children begging for money in the street. Photo by Sally Kneidel. Above, a woman fixing dinner for her children in a coastal town in Borneo. The beached boat is their home. Photo by Sally Kneidel. Indonesia surprised me in a lot of ways. I was stunned at the paucity of wild birds in the jungles of Borneo and Sumatra...until I visited the bird and wildlife markets in Jakarta (the capital of Indonesia). 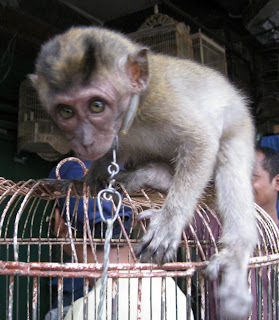 Nearly every town in Indonesia has a wildlife market. 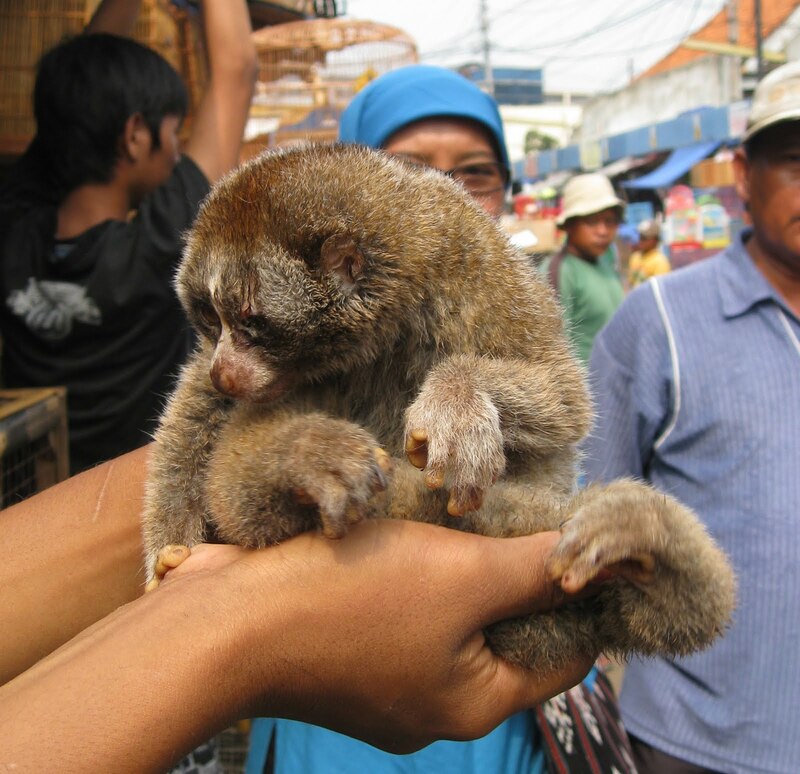 A shocking number of species are for sale in these markets, both legally and illegally. Most of the birds for sale, crowded into small cages often without food or clean water, are wild-caught ordinary songbirds, comparable to bluebirds, robins, or chickadees in the U.S. They aren't birds like zebra finches and parakeets that will breed in captivity. 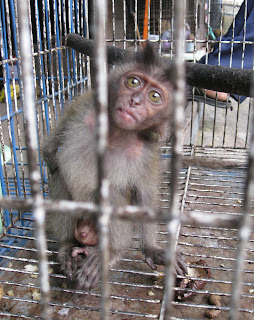 Most vendors in the wildlife markets have a stall or kiosk, but I saw lots of men without stalls just wandering around the markets with a freshly-trapped bird in a small paper bag, or a monkey in their hands, trying desperately to find a buyer. Trying to get me to buy their captive, so they could buy dinner for their families or pay their rent or whatever. It was heartbreaking. A baby macaque for sale at Barito wildlife market in Jakarta. Photo by Sally Kneidel. I was surprised too at the variety of efforts to both protect and make money off of orangutans. Often those two efforts conflict. Ecotourism is definitely a good thing, because if communities can make money catering to tourists who want to trek through the jungle or look at wildlife, then the locals have a financial incentive to preserve the forest and wildlife rather than sell the timber and animals or convert the forest to palm-oil plantations. The conflict stems from the fact that tourists want to see orangutans up close, so they can take pictures. 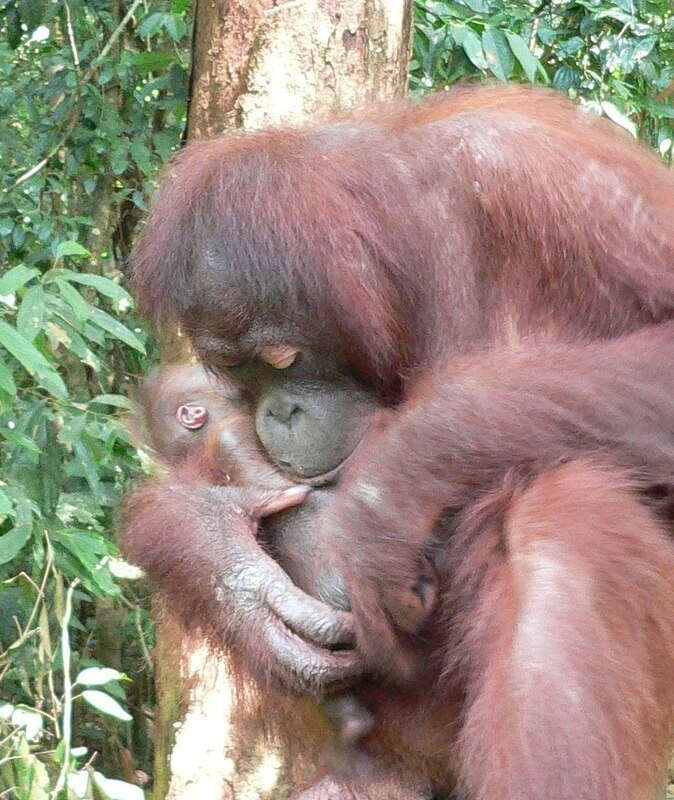 But orangutans and other primates don't normally come close to people unless they expect to be fed. 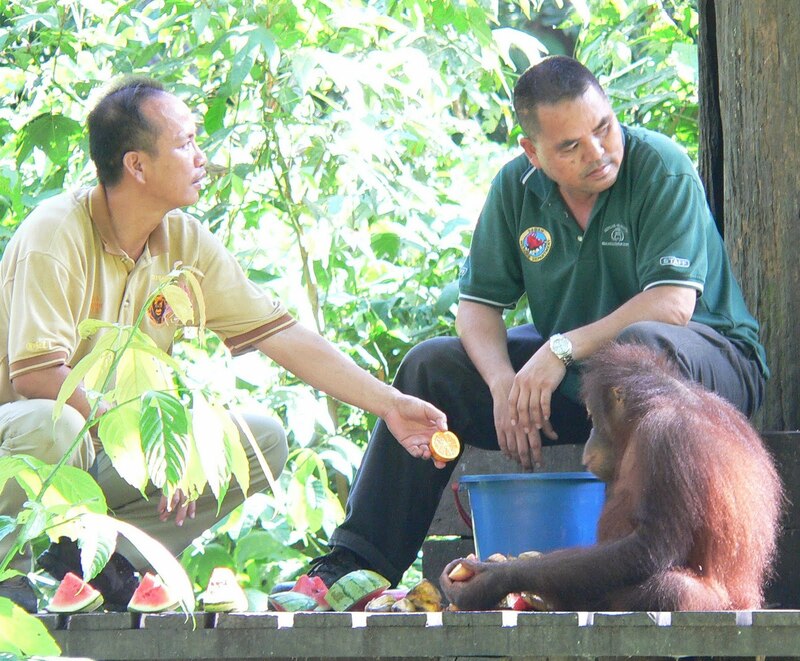 The problem with feeding is that orangutans, being closely related to humans, can and do easily pick up our diseases, and can transmit those diseases to their entire forest population. 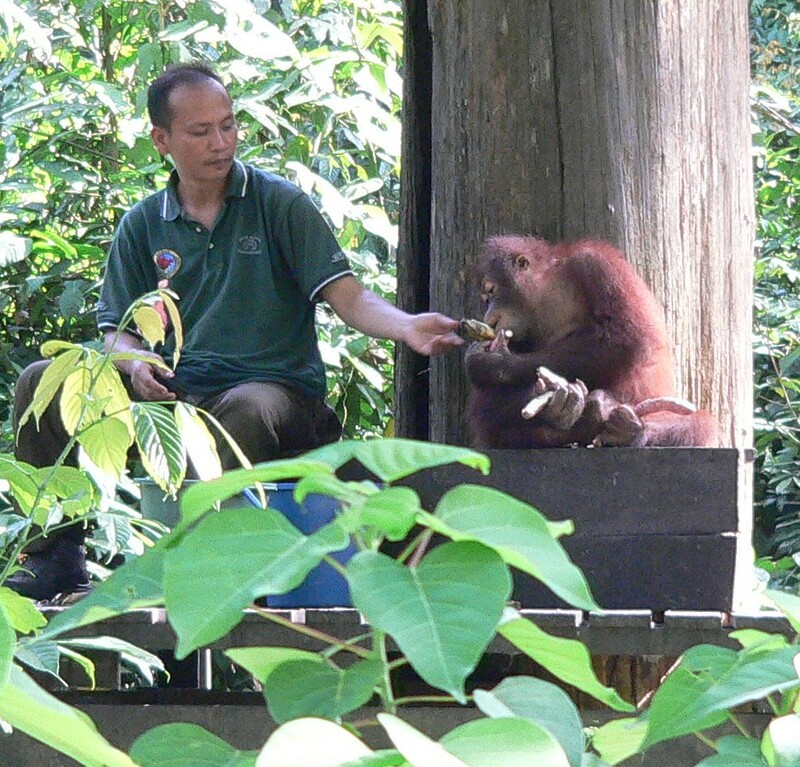 I visited the full range of orangutan-viewing opportunities, from totally wild and never fed, to places where some visitors were able to hold orangutans on their laps. Yet another surprise, for me, was the palm-oil industry. I knew that most of Borneo's forests have been converted to palm-oil plantations. But it didn't really sink in until I flew over the forests of Sumatra, Borneo, and Java and saw that at least 70% of the ground below was palm plantations. Those areas don't support wildlife. And the rain forest that remains is in small fragments, most of which are too small to support breeding populations of any vertebrates other than rodents and lizards. 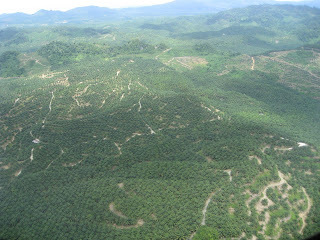 Palm-oil plantations stretch to the horizon, as seen from an airplane over Indonesia. Photo by Sally Kneidel. An emerging market...is that good? Indonesia is a big country, almost as broad as the United States. Globally, it ranks 4th in human population, behind China, India, and the U.S. Not surprisingly, Indonesia has recently been listed as an "emerging market" by Dow Jones and various other financial institutions. Other "emerging markets" include India, China, Malaysia, Brazil, Peru, South Korea, South Africa, and many others. The fact that Indonesia has been categorized as an emerging market means that it will be attracting even more international investors. That could be a good thing. But in the case of Indonesia, I imagine it means more extraction industries - international corporations that harvest/destroy the country's national resources and send the profits to international shareholders. I fear it means that even more of the country's forests will be converted to the lucrative palm-oil plantations. That scares me to death. A large number of "charismatic megafauna" species will inch even closer to extinction - the orangs and various other primates, the elephants, rhinos, tigers, sunbears, etc. Women on the island of Bali, Indonesia, carried back-breaking loads of soil to a construction site for 12 hours a day. Photo by Sally Kneidel. In several posts to follow, I'll explore these issues in more detail. I'll tell you everywhere I stayed on my trip, with contact info, and all the orangutan sanctuaries and forests I visited. I'll show you my clandestine pics of the wildlife markets of Jakarta, pics of wild orangs and other primates, as well as the landscapes, the cities, and the beautiful people of Indonesia. And I'll tell you what I learned about orangutan conservation - what's working, what isn't, and what you can do (from home, or as a visitor to Indonesia). I'll review the conservation organizations I learned more about, such as ProFauna Indonesia, BOS (Borneo Orangutan Survival), Traffic, and (SOS) Sumatran Orangutan Society. What does it mean to live on $2 a day? The issues are complex. The future seems challenging for Indonesia's people and daunting for their tropical forests and wildlife....but not hopeless.